Today I did my first-ever video conference. It was a practice/get-acquainted session for the National Institute for Technology and Liberal Education, where I am to be on a faculty panel next week. Our topic? "Using Technology for Collaborative Student Projects," and I'm to hold forth on both SL and wikis in the writing classroom. Our organizer and NITLE's technologist did a great job in getting us ready, but to be honest, Second Life skills came in really handy. Like the table-etiquette simulation I reported here a while back, SL proves handy for preparing students to other virtual meeting places where their headshots, not an avatar's, fill the screen. Of course, I could not be completely serious, once we were all at ease. 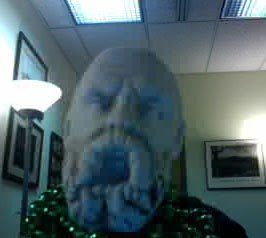 So I froze my camera-feed for a moment, and then put a bust Socrates in Mardi-Gras beads in my place. Scared them for a second. I'll behave better when we have the real event. Maybe. I was able to multitask well between the Marratech's client's features: text-chat, voice, video, and a nifty smartboard feature that lets us all collaborate on making notes, drawing pictures, embedding images, and more. It points the way past the sorts of atrophied forms we have been teaching in universities, to collaboratively authored projects rich in multimedia and, now, interaction from all over the globe. How will we grade such work? The summer ahead gives me time to come up with rubrics for next year, as my students and I begin looking at these sorts of projects.